Visitors come from the countries, United States & United Kingdom. Topics: Vision, Strategy, Executive Committee, and Board Of Directors. Age: The domain is 20 years and 11 months old. On average 5.20 pages are viewed each, by the estimated 959 daily visitors. haibeiflavor.com Anhui Haibei-｜Flavors and fragrances｜Food additives｜Pharmaceutical .. It is hosted by Givaudan Vernier, using IBM_HTTP_Server/7 web server. 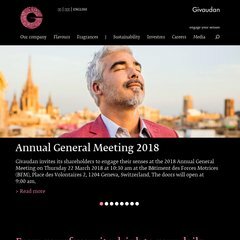 Givaudan.com's server IP number is 193.58.242.13. Its 2 nameservers are ns1.givaudan.com, and ns2.givaudan.com. Its average load time is 712 milliseconds, which is faster than 84% of websites globally.